Dubai: Dutchman Bert van Marwijk has promised to usher in the changes and ensure the UAE have an even chance of qualifying for a second Fifa World Cup in three years’ time. 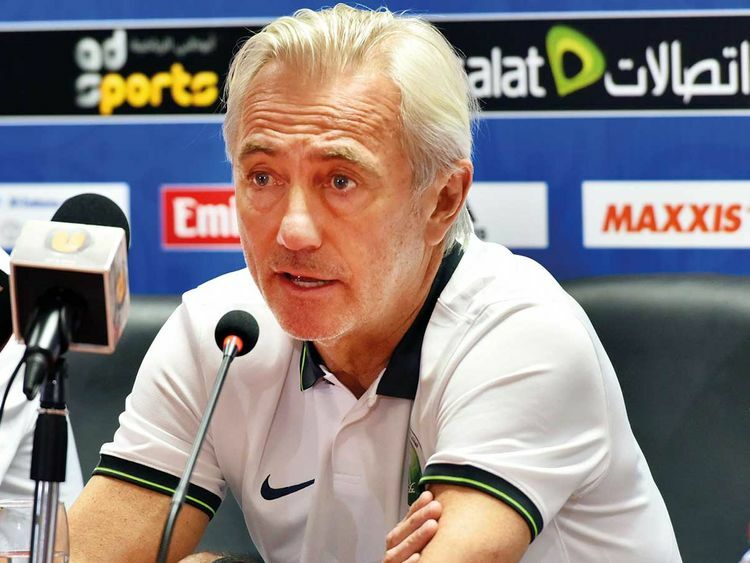 The 66-year-old Van Marwijk, who had formally signed a four-year contract with the UAE Football Association (UAE FA) on Wednesday, was formally unveiled before the media at Al Wahda’s Al Nahyan Stadium before the UAE’s friendly match on Thursday against Saudi Arabia. “I am not a magician, but I am a serious coach who has every intention of bringing in the change in UAE football,” van Marwijk told media. “After spending time in Saudi Arabia, I am more than aware of the tremendous levels of talent present in the UAE. It is my job now to identify this talent and ensure we have a national team that can be competitive enough to reach another World Cup,” the Dutch coach added after being introducted by Abdullah Nasser Al Junaibi, General Secretary, UAE FA. Van Marwijk helped Saudi Arabia qualify for a fifth World Cup in Russia last year, but walked away after being constantly criticised by local media there. He then took over as Head Coach of Australia during their campaign at the 2018 Fifa World Cup, when the Socceroos lost to Peru and France and ended at the bottom of Group C with just one following their 1-1 draw with Denmark. “My job is to ensure everyone gets the opportunity to prove himself. This place is not new to me as I have visited both Abu Dhabi and Dubai in the past on several occasions. I have watched and followed football in the UAE since a long time now,” van Marwijk related. “I want this to be a fresh beginning for everyone. We get together for a common cause and start afresh from now on,” he vouched. Al Junaibi handed van Marwijk a national team jersey. “The new coach will have the responsibility to start off with the qualifying rounds for the 2022 Fifa World Cup,” Al Junaibi said. “We have chosen a coach of his experience after much deliberation and study from the technical committee. We trust in his abilities to lead out national team to glory,” he added. Even though Qatar will automatically book their slot as hosts of the 2022 Fifa World Cup, they will still be liable to play the opening two rounds of qualifying as these are to be used as part of the qualifying process for the 2023 AFC Asian Cup. The remaining 45 nations falling under the purview of the Asian Football Confederation (AFC) have confirmed for the qualifying rounds that are scheduled to get under way from June 6, 2019. Meanwhile, Van Marwijk was on hand to see the task in front of him as he watched his side come back to defeat SAudi Arabia 2-1 in a friendly match played at the Al Nahyan Stadium. Abdul Fattah Mohammad Adam opened the scoring in the 18th minute for the visitors before Bandar Mohammad levelled 10 minutes into the second half. Goal machine Ali Mabkhout fired home the winner with 25 minutes to go.